With guides, areas in the diagram can be highlighted in color. Guides can be defined for every diagram type apart from pie chart, funnel and XY charts. Specify the area, which should be colored, in the first two columns. The color can be selected in the third column. Adds a new row to the list. The values can be edited directly by clicking on the corresponding cell. Removes the selected guide from the list. This option available if a data field with the type Date is selected for the Categories on the Data tab. If the option is selected for the first time, a dialog will open automatically where the guide series can be configured. 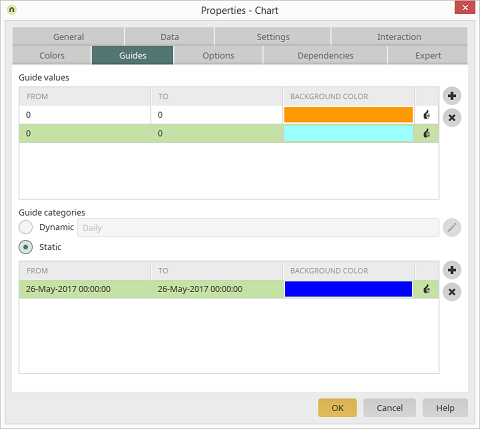 Opens a dialog where the color, series pattern and duration for the guide can be defined. Here, static areas for the categories can be colored in. Specify date values for the area, which should be colored, in the first two columns. The color can be selected in the third column.